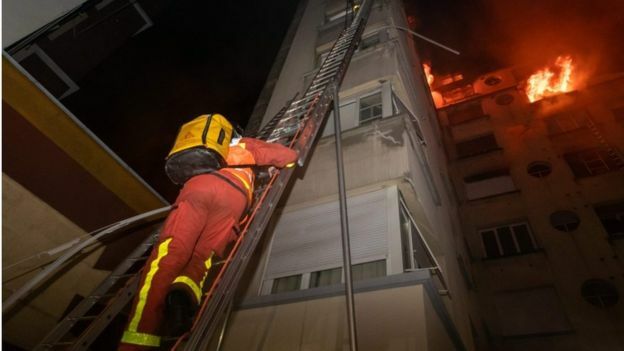 Ten people including a baby have died in a fire at an eight-storey building in south-western Paris, fire service officials say. More than 30 people – including six firefighters – were injured. One person is in a serious condition. Investigators believe the fire was started deliberately; a woman has been detained, the Paris prosecutor said. French President Emmanuel Macron said the country “had woken up to tragedy”, and praised the fire services for their courage. The fire started on the second floor and spread across the block built in the 1970s – unlike many of the older, classic Parisian buildings nearby – shortly after 01:00 (00:00 GMT), forcing some residents to scramble on to nearby rooftops to escape the flames and smoke. About 250 firefighters were deployed to the scene, not far from the Bois de Boulogne park, helping to rescue those trapped on the roofs. Pictures showed flames coming from the top floor windows and firefighters in breathing apparatus scaling ladders to reach residents. Rescue efforts were initially hampered by the fact that the apartments on fire were inside an inner courtyard, with no vehicle access. “When we arrived, we were faced with an apocalyptic situation. Lots of people were calling for help from the windows,” a spokesman for the fire service said. Firefighters said the building’s courtyard had acted as a funnel, helping the flames to spread from the lower to the upper floors. Six firefighters are among the injured, officials say. Surrounding buildings in the area have been evacuated as a precaution. Town hall officials have been tasked with finding alternative accommodation. On Tuesday afternoon, architects working for the Paris police assessed the building and said there was “a serious and imminent danger to the occupants”, who are therefore banned from returning for now. What do we know of the suspect? An investigation has been opened into the criminal charge of causing death by arson. “One person who lives in the building has been arrested. She’s a 40-year-old woman who has prior psychological problems,” Paris prosecutor Rémy Heitz said at the scene. Several local residents said the fire had started after a dispute between neighbours in the block over loud music. Paris Mayor Anne Hidalgo sent her condolences to the victims, and visited the site on Tuesday morning, along with Interior Minister Christophe Castaner. This is a well-to-do apartment building in an affluent neighbourhood. Other recent, deadly fires in Paris have been in poor, overcrowded areas where safety norms have clearly being ignored. By mid-morning, the fire had been extinguished and normal life was resuming. Sounds of children playing came from a schoolyard next door. But groups of people were milling about, residents from neighbouring buildings who had been told to leave their homes. They wanted to know when they could go back. The occasional witness arrived who saw it all: the screaming, the flames, the people on seventh-floor window ledges staring into the void.They said they wouldn’t ever forget.